Build community in a friendly atmosphere with other women scientists and engineers while participating in informal dialogue and exploration of new ideas and reducing isolation. 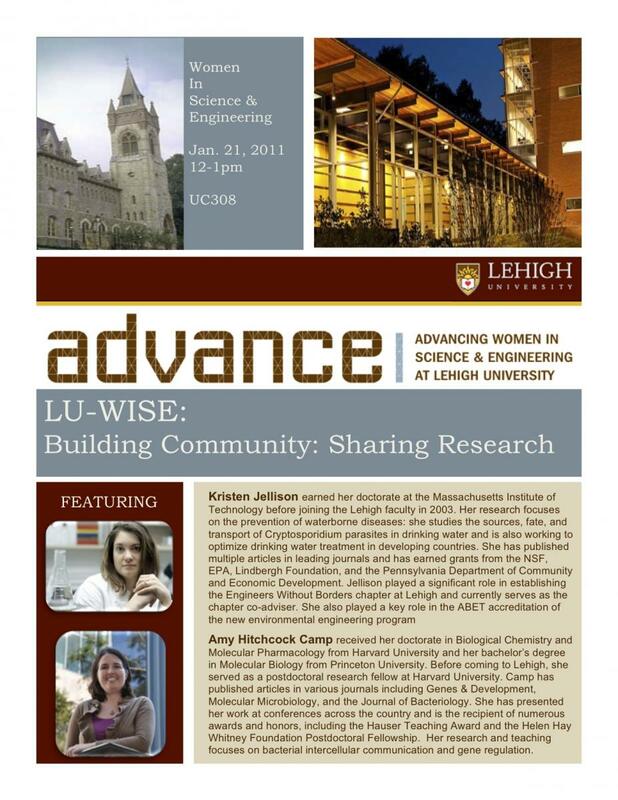 Lehigh ADVANCE will host LU-WISE Luncheons monthly, throughout the academic year. Women STEM faculty, adjuncts, professors of practice, and post-doctoral researchers are invited to attend. Post-docs, Graduate Students, and undergraduate students in STEM seeking to network should look for the Student WISE group. Topics will be added as they are confirmed. Look in the Events list for more details and RSVP links. September 23, 2016: Semester Plans: What's in store for ADVANCE, What's in store for you? High level overview of 16-17AY goals for ADVANCE Center. Then, related to time management in the academy, we referenced concepts from Every Semester Needs a Plan for strategic goal and project planning for the things that matter most, but tend to have low built-in accountability. October 13, 2016: Eileen Pollack, author of The Only Woman in the Room: Why Science is Still a Boys Club, UC303 12-1:30 for book talk and book signing. 2-3pm in Women's Center for student meet & greet. This year, in addition to Luncheons for Career Development and Networking, we will schedule several 4 hour or 8 hour Writing Retreats for interested STEM Faculty Women. Look for RSVP links. July 25, 2013: UC 302 Brown Bag Lunch, dessert and drinks provided. 2012-2013 ADVANCE LU-WISE Activities mostly relate to service and faculty career resources. Other opportunities are advertised or sponsored. February (TBD): Resources and Reputation: Discuss opportunitites on campus to take your impact to another level by investigating institutional funding streams, international opportunities, and paths to be more visible on campus. February 26-27: NSF ADVANCE Site VISIT Women STEM Faculty are included in various stakeholder focus groups with the NSF ADVANCE Site Visit Team. 2011-2012 ADVANCE LU-WISE Luncheons will relate to the theme of interdisciplinarity. Participants will continue to have the opportunity to set the tone and topic. Celebrating Lehigh's STEM Women, Focus on pursuit and outcomes of interdisciplinary research by women. Spring 2011: Building Community, Sharing Research. See the slides and photos from the sessions on this page.